Each patient we see comes in with a unique set of needs, and we work to ensure they receive proper diagnosis, excellent care and a treatment plan that accommodates their lifestyle. This patient is a high profile figure, who spends the majority of his time in front of the public eye. As a result, he cannot ever be seen without a complete smile, or undergo procedures with extended healing times. 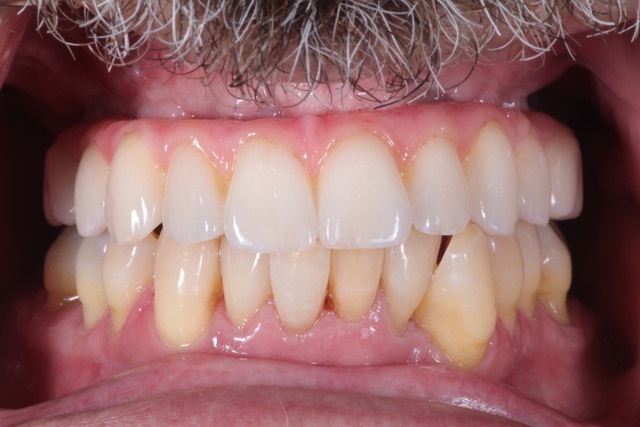 After a careful diagnosis, Dr. Aalam determined this patient suffered from periodontal disease, which left his teeth and gums inflamed, decayed and seriously infected. 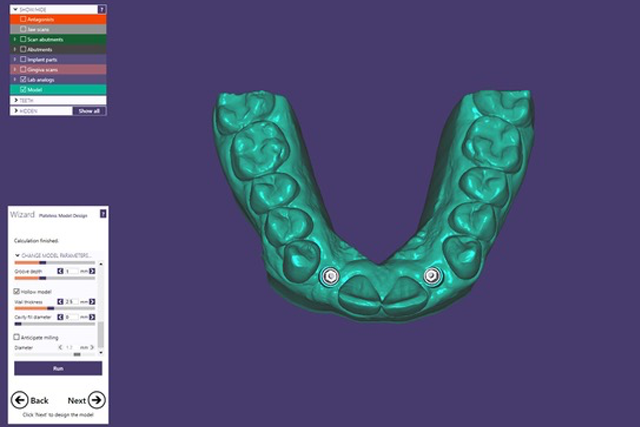 As with any case, thorough diagnosis is required to ensure each patient is receiving sensible care for their unique case, with the goal of restoring optimal oral health. Without quickly jumping to extreme forms of treatment, after proper evaluation Dr. Aalam safely concurred that the patient’s lower teeth could be treated with periodontal therapy, and the patient could actually keep his own teeth. 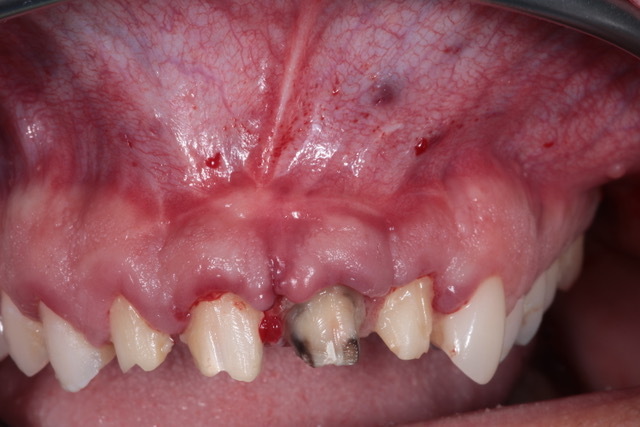 The top teeth were severely affected by periodontal disease and extraction was necessary. 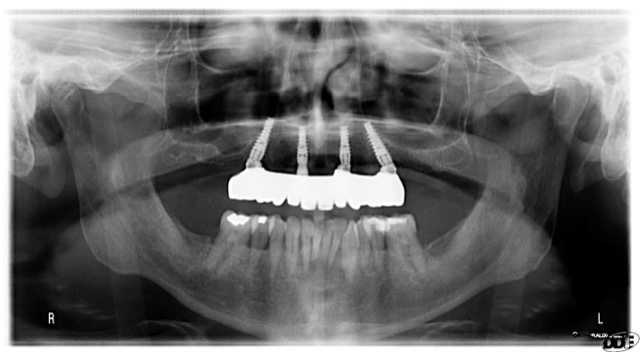 Four implants were placed in the upper jaw, two straight and two tilted, and an immediate temporary prosthesis was placed. Dr. Reshad of Art Lab Dentistry created the final zirconia reconstruction and once the tissue healed, the final restorations were placed! 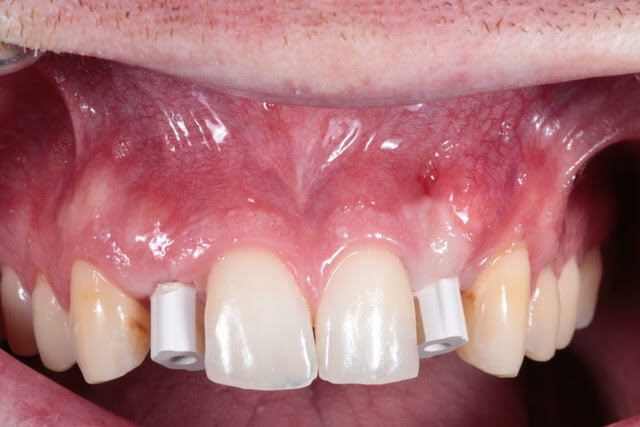 When left untreated, periodontal disease can progress to extreme cases of periodontitis, that causes the teeth and gums to decay and completely fall out. This patient came in with an advanced case of periodontitis, where the gums were so inflamed, his top teeth completely fell out. 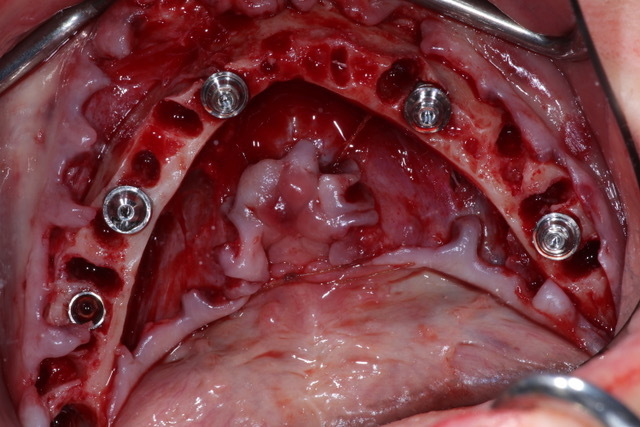 As evident in the picture, he also experienced extreme decay in the bottom teeth as well. 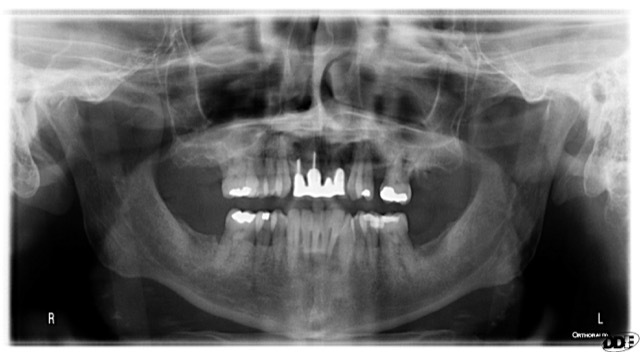 Not only was this patient in need of a complete smile transformation, he needed the restore his oral health. Periodontal disease can cause a number of health complications, and if left untreated not only affects one’s smile, but also overall health. Did you know periodontal disease can affect heart and respiratory health, brain health and cause pregnancy complications? It is imperative to treat periodontal disease at the onset when it begins with gingivitis, a mild inflammation, to avoid detrimental health effects down the line. 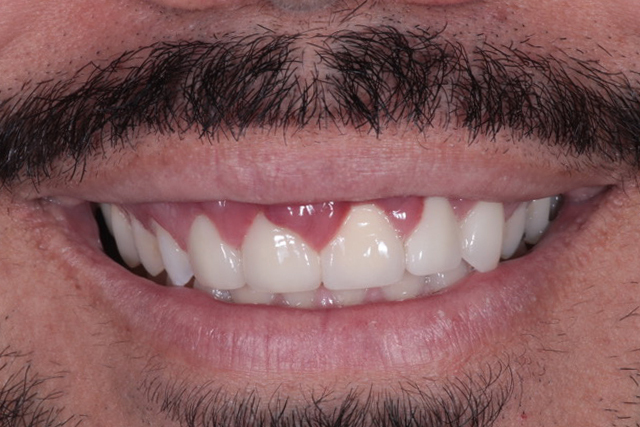 After a thorough diagnosis, Dr. Aalam determined this patient would need to have his bottom teeth completely removed, and multiple dental implants would be placed in both in the upper and lower jaw to restore this patient’s smile. 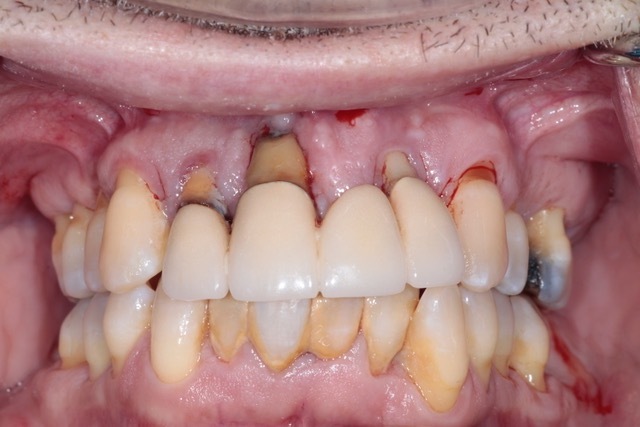 In his first appointment, the infected lower teeth were removed, and five permanent dental implants were immediately placed in the upper jaw. In order for the patient to leave with what appeared to be a complete set of teeth, to avoid any embarrassment as well as discomfort when chewing and speaking, we worked with Dr. Stephanie Young, who provided a fixed temporary prosthesis on the day of the procedure. 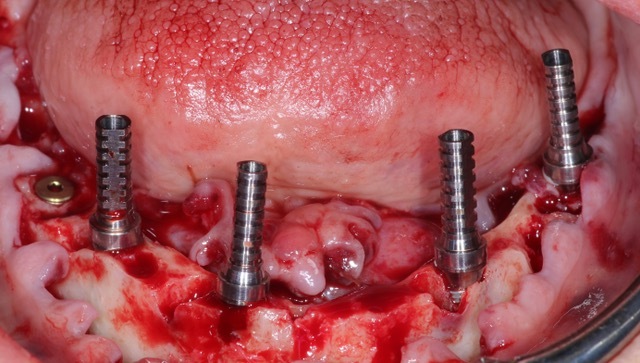 After three months, the tissue around the implants completely healed, and the osseointegration process was complete. 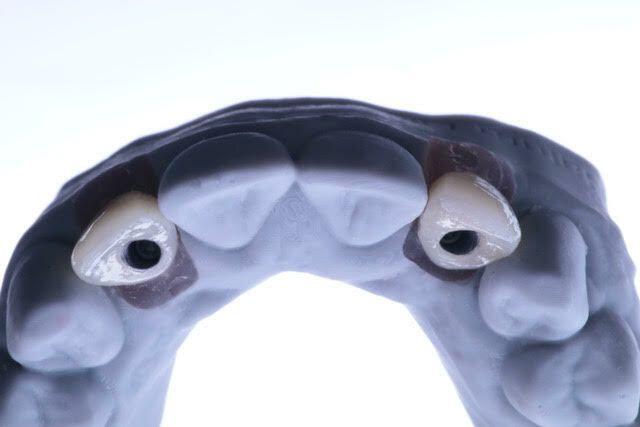 This is the process where the permanent dental implants naturally fuse to the jaw bone, as the new implants serve as the ‘tooth roots.’ A final full arch zirconia reconstruction was secured to the lower jaw to replace the teeth that were removed. 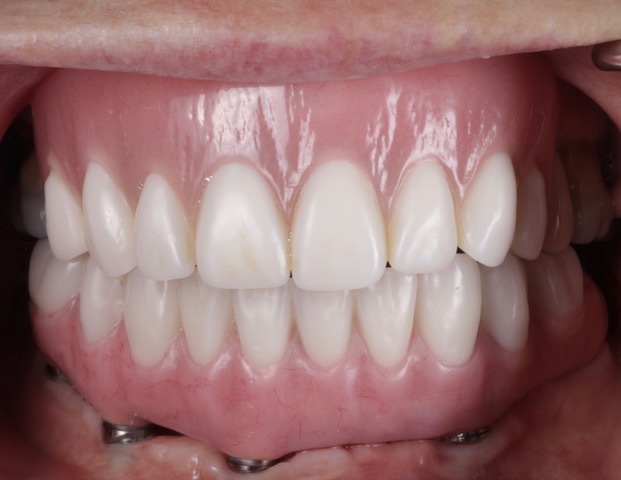 In this case, we placed an overdenture, a particular type of dental prosthesis, on the upper jaw, to complete this patient’s smile, and restore his oral health! We had a unique opportunity to correct a faulty dental job performed by a different provider. We strive to ensure each patient receives excellence in care, personalized plans to treat their particular cases, and life-changing results. 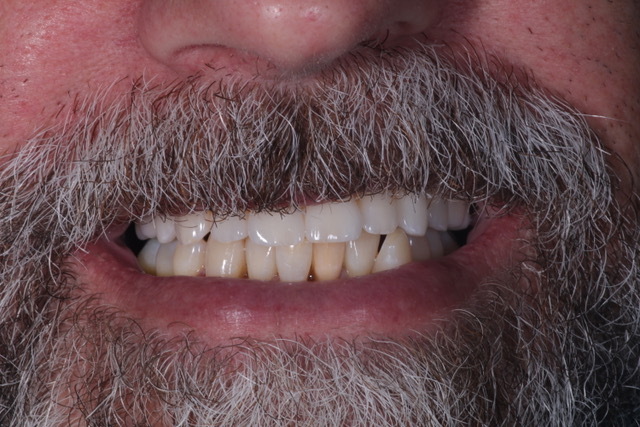 Although this becomes challenging when we’re correcting damage sustained by a different provider while also treating the initial problem, we successfully rejuvenated this patient’s smile and restored his confidence! 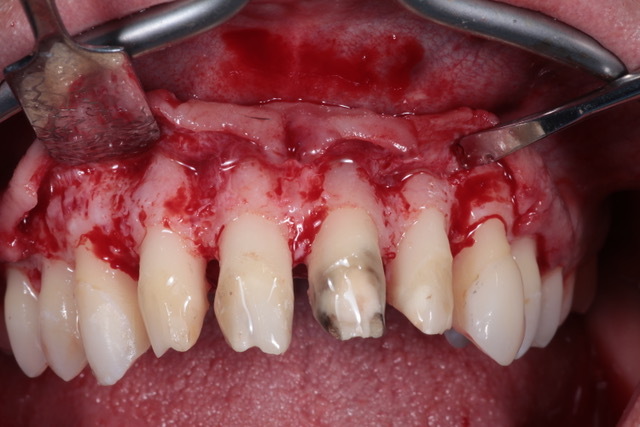 This patient came in with gum tissue inflammation as a result of inadequate tissue handling in the case of an incorrect crown lengthening procedure. 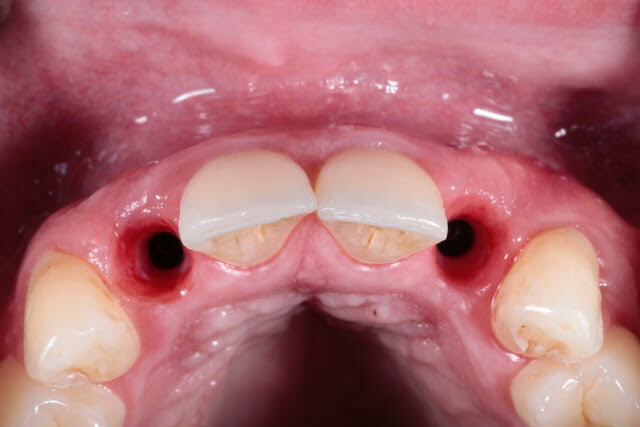 The treatment was initially done to correct his gummy smile because he experienced excessive gum tissue that covered his teeth and an uneven gum line. 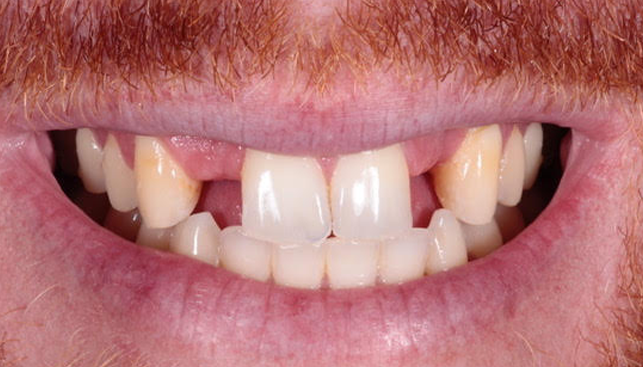 He opted to treat the gummy smile, but an incorrect diagnosis led to an incorrect treatment. 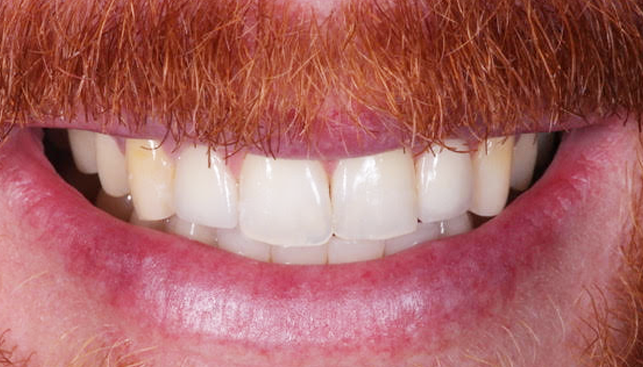 As a result, his gum line remained uneven, and his tissue became damaged. 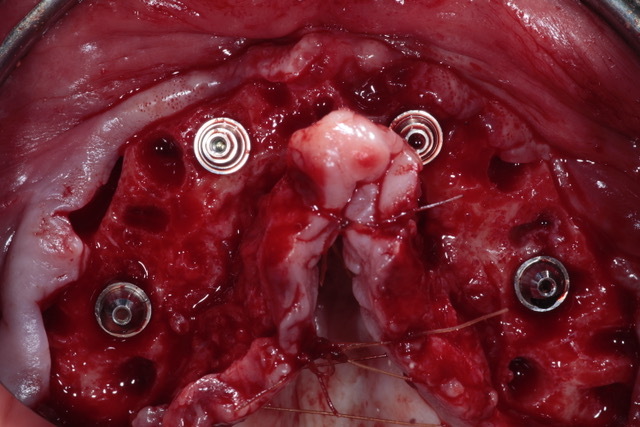 Upon closer examination, Dr. Aalam diagnosed the patient with having excessive gum tissue, as well as underlying bone, both which needed to be removed. Dr. Aalam performed osseous surgery to remove the excessive bone, and a crown lengthening procedure to eliminate the inflammation and excess tissue. 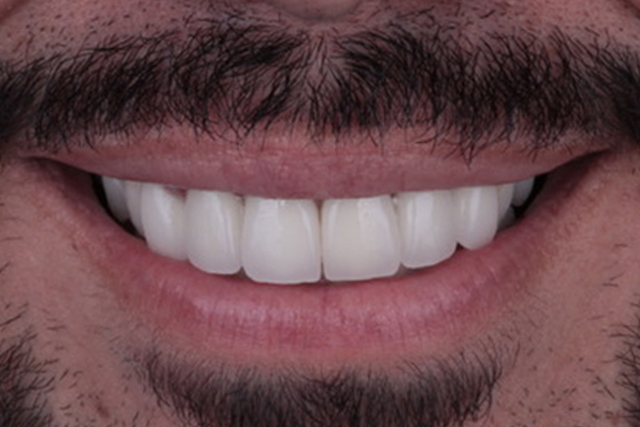 As a result, Dr. Aalam successfully re–established gingival and smile harmony, and provided this patient with a broader, more beautiful smile!